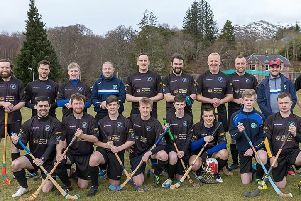 Stornoway began their 2017-18 campaign in the BT Caledonia Division Two North League with a home defeat to Ellon. The two sides won their home games in last year’s league but after a difficult pre-season for the home side and the loss of some key players Ellon went into this match as favourites. As it turned out the two sides produced an exciting game of open rugby, with the result in doubt until late in the game. The sun was shining at Bayhead, with just enough breeze to keep the midges at bay thanks, to the huge relief of the sizeable crowd! Ellon settled quickly and the home side found themselves 10-0 behind within ten minutes as Ellon scored two unconverted tries and looking as if they could run away with the game. It was obvious from early on that Ellon were going to dominate the scrums but to their credit Stornoway eight stayed honest in retreat giving scrum half Gareth ‘Boyo’ Baker and No.8 Malcolm D-J a chance to at least secure possession. Stornoway struck back, showing great ambition, and were ahead after 15 minutes thanks to two Farrell penalties and a try from Shaun Smith, converted by Farrell. Shaun’s try followed some good work down the right hand side by backs and forwards, quick ball allowed Shaun to hit the line at pace, bursting through tackles and storming over the line between the posts. Ellon hit back with a converted try just before half time, scored by former Stornoway player John Campbell, and they went further ahead shortly after the break with a well-worked try, which went unconverted. Stornoway then had their best spell, with stand-off Angus Williams controlling play well, some typical hard running from Andy Macleod and good driving play from the forwards. A big plus was the work at the lineout with captain for the day Alick Graham connecting well with Liam Callaghan, with Liam also causing problems on Ellon’s throw. From a driven lineout and some strong pick and go’s the Ellon defence were sucked in leaving space for Euan ‘Fish’ Mackinnon to run in to score. Farrell missed the conversion. It was then Ellon’s turn to exert some pressure in an effort to put the game out of sight, and when they were awarded a scrum 5 metres from the Stornoway line it was clear their forwards would have one thing on their minds. Sure enough they drove the home pack backwards for a deserved forwards try. Shortly after they scored again with a well-worked move that held the home defence leaving room for the stand-off to score between the posts. Both tries were converted and Ellon had a 20 point cushion. The home side didn’t give and continued to push forward. All this helped keep the home side camped in the Ellon half but committed defence kept them out Og Macarthur came close from a tapped penalty and Boyo Baker appeared to grounded the ball from the back of a ruck, but the referee ruled that it was held up. Eventually the breakthrough came when Boyo took a quick penalty 10 metres out from the line and was tackled early by players in offside positions leaving the referee with little choice but to award a penalty try. Ellon completed the scoring with an opportune try from a charged down kick. Senior team coach, Angus ‘Bubble’ Mackay was pleased with his team’s performance overall. This was the start of what will be a very challenging season for all teams involved with another change to the league structure meaning that each team will have to play 22 matches. It’s going to be a long season, but based on this performance we can expect plenty of exciting matches at Bayhead over the next eight months! Stornoway’s next fixture is away to Garioch RFC in Inverurie this Saturday. This Saturday morning Stornoway Juniors section welcome Caithness RFC to Bayhead for matches at S1/2 and U15/16 level in the Caledonia Tier 4 North Whole Club Conference. Our Under 18’s are combining again this season with Ross Sutherland in the Caledonia U18 League and this week travel to St Andrew’s to play Madras RFC.